A vase-shaped tree, that can become more rounded with age. The leaves emerge with a bronzy tint, become green in summer, then turn to orange and bronzy red in the fall. 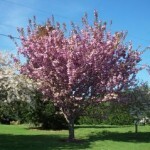 It is best known for the large, fully double, pink blooms that cover the tree in spring. 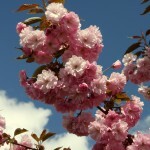 It flowers best in full sun, preferring a moist, fertile, well-drained soil. This is a sterile tree.